Two weeks ago, I mentioned in my previous blog post that I have accumulated quite a few empties over the past few months and just haven't had the time to share with you this collection of products. As promised, here is part 2 of my empties adventure - with a good mix of skincare, haircare and even a sunscreen! I find that with my empties, there seems to be a recurring trend of a few products. This post especially contains some old favourites which you may have seen pop up in previous posts. However, there is a reason why they keep springing up all the time - they just happen to be some of my tried and true holy grails. Read on for part 2 of my empties! ***Please note anything with a * has been kindly gifted to me without the expectation of a review. These are my own honest opinions, and the reason why I am writing about them is...well...they are empty! I am not going to lie, but a GOOD mineral sunscreen can be quite difficult to find, especially ones that feel nice on the skin, sink in nicely, work well with other products and leave little/no white cast. If you are looking for a mineral sunscreen like this - I would suggest looking no further than Maelove's The Sun Protector. This mineral sunscreen uses zinc oxide (18.6%) as the main filter and has a really lightweight feel once applied on the skin. For my medium toned Asian skin, it leaves little white cast and it sinks in very nicely on the complexion. It doesn't feel like a typical mineral sunscreen (ie. heavy), instead it feels quite sheer and light on the skin. I find that I can apply this over my moisturiser and underneath makeup quite easily as it leaves a natural finish to the skin. In terms of how well it sits underneath my primer and makeup as I haven't had any issues when using it with my usual Nars Sheer Glow and J.One Primer. I enjoy the fact that this doesn't have any smell to it. It doesn't smell like sunscreen and it doesn't smell heavily fragranced (this is fragrance-free). This mineral sunscreen is also quite hydrating on the skin as well and can also double as a primer due to its smoothing, natural finish. The only downside for me for this formula is the fact it is only an SPF30 - I would personally love to be a SPF50+ so that I can wear this to the beach or on a day where I spend a lot of time outdoors due to its fantastic formula and feel. Maelove's The Sun Protector is probably one of the best mineral sunscreen formulations I have ever tried in both its cosmetic elegance and its price is one that I think is quite hard to beat! It's great value. Maelove's The Sun Protector is USD$17.95 for 50ml and can be purchased on the Maelove website. If you are looking for a simple eye serum/treatment that helps to hydrate and depuff the eye area then the Mabel + Meg Enchanter Eye Serum might be right up your alley. This eye serum has been an absolute saviour on days where my eyes have felt dry or irritated due to allergies, as it helps to soothe around the eye area and also works to plump and hydrate underneath the eyes like no other. I love the fact it is both so gentle and hydrating, making it perfect to use at any time. The fact this eye serum is so moisturising and plumping makes it the perfect remedy to help with concerns such as fine lines around the eye area and its soothing nature makes it really helpful against puffiness and dark circles. The Mabel + Meg Enchanter Eye Serum often makes an appearance in my skincare routines due to the fact it is so effective in keeping my eye area hydrated and it truly is a saviour for my sensitive eye area, especially when it is irritated and dry. Its incredibly gentle formulation and lightweight feel makes it perfect for me to use both day and night and it also works really well mixed in with a concealer. This is one I will defnately be repuachsing. Mable + Meg's Enchanter Eye Serum can be purchased from Mable + Meg directly for GBP £29.00, USD$38 and AUD$51 for 15ml. I never really understood the hoo-ha over Josh Rosebrook's The Hydration Accelerator until I tried it for myself and I have to say its absolutely stunning! The scent is so delicate, fresh and relaxing and it works to not only freshen the skin but also to revitalise your mood. This mist can be used at any time - after cleansing to help balance out and calm the skin, as a final step of a skincare/makeup routine or during the day as a quite spritz to look hydrated. I find that this gives the complexion that added hint of hydration to keep the skin looking dewy and healthy at any time of day. What I also really enjoy about Josh Rosebrook's The Hydration Accelerator is the fact that its applicator also actually 'mists'. There are no nasty spurts of product on the face, instead, this beautiful liquid mists evenly and gently on to the complexion. 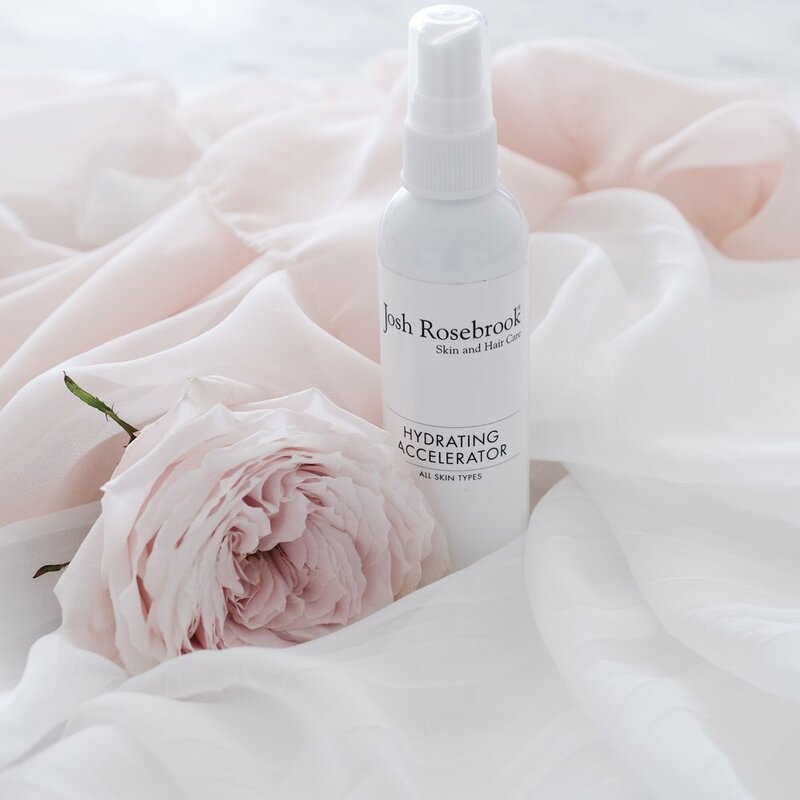 The scent, fresh, dewy complexion and even application that Josh Rosebrook's The Hydration Accelerator gives is a few of the reason's why this is a favourite among many. The Hydration Accelerator can be purchased from Josh Rosebrook directly and is USD$35 for 120ml. This product doesn't really need any introduction - it is by far one of my favourite night time serums of all time. It's a real testament to just how much I love this serum as I have gone through about 4 of these now. It is a holy grail for me and for a more in-depth review, I have written one here. My scalp is super sensitive and quite often, hair products just don't seem to want to work with me. Over the past 6-7 months, I have had a few reactions to hair products resulting in an itchy, flaky scalp. When Oribe released the Serene Scalp range, I knew that I had to give this a go as the Gold Lust shampoo and conditioner are my holy grails. Every instance where I had a reaction, I would use the Serene Scalp shampoo and conditioner and after a few weeks of use, my itchy, flaky scalp would be no more. The shampoo itself is lovely to use and it does have a nice lather, despite not having SLS in the formulation. It doesn't leave my hair as soft as Gold Lust, but keep in mind this isn't the sole focus of the range. The shampoo in conjuction with the conditioner has really helped with my scalp and my issues with dandruff and for that, I will absolutely be repurchasing and keeping this aside as a backup. The Oribe Serene Scalp Balancing Shmpoo can be purchased from Beautylish for USD$44 for 250ml. The Oribe Serene Scalp Conditioner is the perfect partner to the shampoo and helps to soothe the scalp and detangle the hair. It works really well not only with the Serene Scalp Shampoo but also with others as well (I have used this with Gold Lust before). I find that this conditioner works quite well to keep my hair looking soft and smooth and is the perfect balance to the matching shampoo which does contain actives such as salicylic acid. Whilst again, the results aren't quite the same as the Gold Lust range, it is important to remember that the Serene Scalp is mainly there to help with issues such as dandruff. It still does leave my hair looking and feeling soft, smooth and healthy. Compared with other anti-dandruff ranges, this not only assists with the issue itself but still gives the hair that glossy, smooth, silky finish we all love. Plus the packaging is super pretty in pastel pink! There is no doubt that both the Serene Scalp range does have the typical Oribe pricing attached to it, and whilst there are other cheaper alternatives out there, the brand seems to have always worked with my scalp and trying something completely new again was a risk I didn't want to take. For me, if you already have a great routine for dandruff then stay with what you already have (especially if it is cheaper!) and don't jump ship just yet. However, if you are like me and Oribe seems to be a brand that just works for you, definitely look into the Serene Scalp range. The Oribe Serene Scalp Balancing Conditioner can be purchased from Beautylish for USD$46 for a 200ml tube. I have spoken about how much I adore this little serum and how I am adamant it is made from unicorn tears as it works to heal my skin lit no other. PIH marks are gone, as this little beauty helps to heal those dreaded pigmentation spots caused by pimples (and in my case picking). Using plant stem cell technology, the liquid gold in this little green bottle works to repair and heal the skin in a record amount of time. I find that my PIH and scarring disappear so much faster when using this and I don't think I could ever be without this. Ever. My skin just loves this that much and I love the rapid results that I get from using this. I usually use this to spot treat on any blemishes or on areas that I have been naughty and 'picked' at. When applied on a fresh blemish, I find that it overnight, it has already started to heal and diminish, redness is absolutely reduced. However, the real magic with this happens with areas that I have attacked or are in the healing phase. Within a week of constant use, the area in which I have spot treated has healed significantly. Depending on the scarring, I find that within 2-3 weeks the area of pigmentation has almost disappeared or has lightened significantly. Usually, around the 5-6 week mark, traces of PIH have completely disappeared and the area of skin looks like nothing had ever erupted. The sheer efficacy and speed in which my skin heals with this little bottle of magic astounds me and is the reason why I will continually purchase this again. This is an empty which I had actually finished a very long time ago and always kept forgetting to add this on to my list! Overall the Jordan Samuel Skin The Performance Cream is a fantastic, lightweight and hydrating moisturiser that works well on its own but also mixes in well with other serums and oils. It's a great 'basic' moisturiser which aims at doing exactly what a moisturiser should do - keep the skin hydrated and to also lock in any other products underneath. You can read all about my thoughts on this in an in-depth review here. Jordan Samuel Skin's The Performance Cream can be purchased directly from the Jordan Samuel Skin website for USD$38 for 60ml.